This is a picture of Ed Dittmas' gas station at the corner of Morris Park and Matthews Avenues in the Bronxdale neighborhood. It would later become Molina's (Carl and his father) gas station. It goes back a long way. This was McKinley Square, where 169th Street crosses Boston Road. We're looking north along Boston Road. It was taken in 1926, when my father was a student at Morris High School, a few blocks south of this spot. This was the Holy Nativity Episcopal church on Bainbridge Avenue by the corner of 204th Street, in 1938. We lived around the corner at 3135 Rochambeau Avenue. This picture was taken in 1957. The apartment building on the left is 751 E. 181st Street, where I grew up. It is no longer there, having been replaced by row housing. The car in the foreground is sitting on Prospect Avenue. It is a '49 customized Chevy my friend put together. The chain link fence on the left enclosed an empty lot, where today there are row houses. On the right side of the picture were one and two story private homes which are all gone and it is now a block-long ball field. Most of the apartment buildings on Prospect Avenue are no longer there. This was me in 1956 (guess which one was me) with my uncle, mother, and grandparents, taken by my father. The location looks like Bronx Park, where I spent many happy days climbing the rocks and digging up chestnuts while my grandfather smoked his skinny Erik cigars. My grandparents lived in a third floor walk-up on Barker Avenue. The view behind is likely Bronx Park East, between Arnow Avenue and Britton Street. Editor's Note: Phil is correct regarding the location. The tall buildings to the far left were part of the Parkside Projects, and those directly behind him were known as the "Coops." This picture was taken around 1966. I was in front of the Nonnan Plaza at 168th Street and Nelson Avenue. Sacred Heart School had just let out for the day. In the upper right side was the old Noonan Luncheonette where we would grab lunch many a day, or we would head further down the block on 168th to Three Sargent's Pizza. You can also see Dr. Posner's Shoe store next to the luncheonette and faintly see the sign for the old MET Supermarket further down the block. There was also a great bakery a couple of doors down from the shoe store. You can't tell in this black and white picture but I loved the old red bricks that used to pave the street at that time. This picture was taken during the 1968 Bronx Day parade. I was marching in the parade with my team from the Highbridge Little League. We were on 161st Street, just east of River Avenue. You can see the Bronx County Court House on the upper left of the picture. The parade ended at McCombs Dam Park across the street from Yankee Stadium. 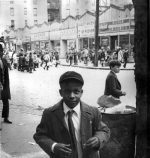 This was Police Officer Albert Nasi, my father, on the Grand Concourse at 149th Street. This picture was taken in 1955. This was the Mosholu Branch of the NY Public Library on 205th Street, ca. 1955. Prior to the building of the Mosholu Library, the nearest public library was on Bainbridge Avenue at Fordham Road.